So states one of the nine protagonists of a story good enough to change minds, and perhaps the world as a result. The Overstory weaves the growing science and philosophy of biocentrism with traditional myth and with emerging legends of our digital creations, all illuminated and explored by multiple human narratives. The result offers us a desperately needed alternative path into the future, characterized by relationship rather than exploitation; satisfaction of actual needs rather than endless pursuit of ceaselessly manufactured wants. 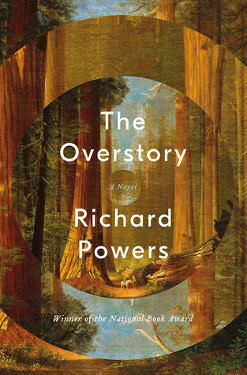 Other reviewers (such as Barbara Kingsolver) have extolled the book’s literary merit. As expected from an author with a decades-long string of major awards, Powers’ writing is excellent and engrossing. The story builds slowly as Powers grows its roots one person at a time. The mini-biographies are engaging in and of themselves, but the real payoff comes once they intertwine. It’s difficult for us short-lived humans to understand a time perspective an order of magnitude larger than our own, but the patient arc encompassing multiple generations nudges the reader towards thinking on the scale of forests. In many ways this is the antitheses of T.C. Boyle’s A Friend of the Earth. Both books revolve around the practical and moral questions of how to respond appropriately to environmental atrocity after atrocity, with one answer being ecosabotage for planetary self defense. But while Boyle’s book is nihilistic, with unconvincing characters motivated by often petty anthropocentric goals, Powers writes eight realistic journeys of people who come to respect, even love, trees. All make sacrifices for their nonhuman kin, some even risking freedom and their very lives. Several are fully biocentric, recognizing trees as intelligent, communal beings and rejecting the notion of human exceptionalism. Powers sympathetically portrays the decisions to take underground action, making it easy to understand why the activists in his novel, like those in real life, escalate to illegal tactics. With the system designed to coopt or disempower dissidence, and well practiced at circumventing democratic processes and brutally suppressing protest, anyone wanting to make substantive change is forced outside the box of accepted and expected tactics. Unfortunately, as in A Friend of the Earth, the novel’s ecosabotage is ineffective because it’s limited to a strategy of attrition and doesn’t target critical infrastructure. The eco-fiction genre still needs a story of strategic activists instigating cascading failure by shutting down fossil fuels. To be human is to confuse a satisfying story with a meaningful one, and to mistake life for something huge with two legs. No: life is mobilized on a vastly larger scale, and the world is failing precisely because no novel can make the contest for the world seem as compelling as the struggles between a few lost people. But Ray needs fiction now as much as anyone. The heroes, villains, and walk-ons his wife gives him this morning are better than truth. Though I am fake, they say, and nothing I do makes the least difference, still, I cross all distances to sit next to you, keep you company, and change your mind. Perhaps it’s true that even the best arguments won’t change minds. If so, then what we all, human and non-human, need right now is fiction which can. The Overstory may be just that.